When I was in the radio business, the radio station owner in which my program was broadcast said he " hoped to go to hell, to see all the rich preachers thrown into the firey pit." He was serious. He had so many dealings with ministers who would buy air time on Sunday, and then not pay. There's a reason they tell you to jump to Malachi 3 ~ Read the first sentence in Malachi. On Judgement Day, I don't want to be anywhere near these money-grubbing clowns. The blast radius will be huge. Kind of off the subject but FBC Dallas pastor a few days ago decided to anoint Republican front D Trump with prayer and laying on of hands along with some of his fellow men and women of God. Along with Jeffries was the Reverand Kenneth Copeland,Reverand Paula White and the Reverand David Jerimiah. Least I forger the Reverand Jan Crouch from TBN also participated. Actions do speak louder than words so I have nothing more to add. Malachi was written to the Jews so all you Gentiles put your money in a retirement account. Trust me you will need it. It was literally directed at his mega-church pastor buddies. Last December-January 2015 Creflo banded together with Gateway Elder and Marriage Today prophet Jimmy Evans and Gateway Senior Pastor Robert Morris to sell a prosperity multi-media package on Gateway Elder, James Robison's TV show Life Today on Daystar. For 18 consecutive broadcasting days - covering the entire Christmas season - these four men celebrated the "reason for the season" (money, money, money) by touting their "Jesus died to make you rich" scheme to the poor and desperate. It only cost $120 or $1,200 for the deluxe edition. 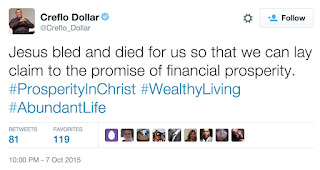 See http://lifetoday.org/video/financial-peace/ Creflo, Jimmy and Robert got to keep all that cash. Morris and Evans pretend to distance themselves from such flagrant prosperity gospel money grubbing. 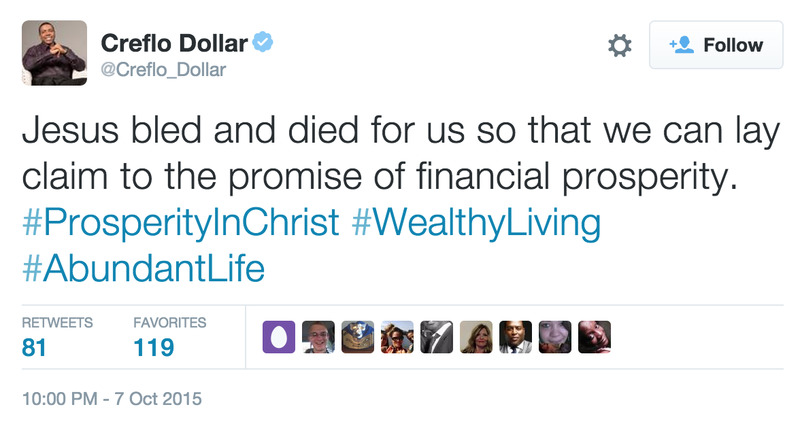 Neither of the men hocked this package from their pulpits, but they are every bit as bad as Creflo Dollar. They just have slightly better PR teams handling their social media.